Stump Petuni is a game that Mario can optionally play in Paper Mario: The Thousand-Year Door. The game consists in making an easy question that Petuni can answer, with the only question she can answer being "Mario likes which person the most". 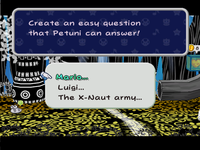 Just by making this question, Petuni will instantly answer "Princess Peach", and will give Mario a Mystic Egg. If he asks any other question, she will get angry due to not understanding, primarily due to most of the other possible questions being nonsensical, and Mario will receive nothing. for the heck of it? This page was last edited on October 28, 2018, at 17:28.